The other day, on a sidewalk outside a thrift store in Madison, Wis., a framed poster propped against the window stopped me in my tracks. It showed a sailboat barreling toward me on a port tack – through a wheat field! The artwork captured beautifully a remarkable and unique sailing adventure in U.S. history – a home-grown Midwestern attempt to win the America’s Cup. 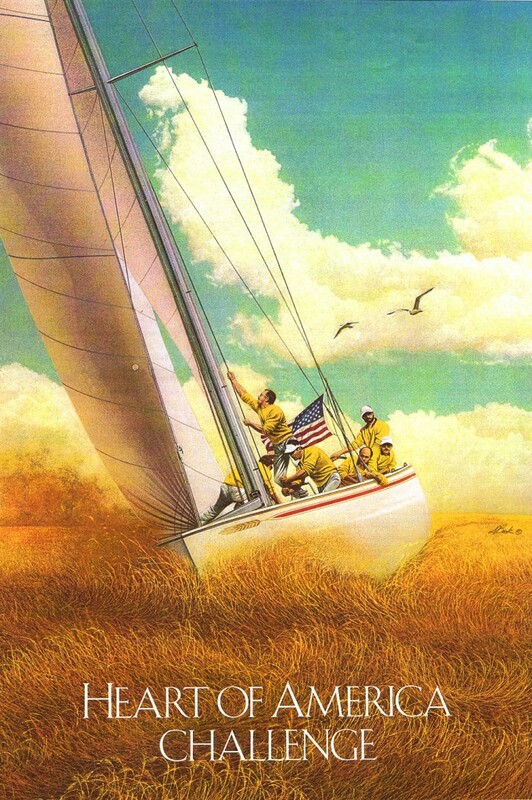 In a year when billionaires battle for the cup with Star-War-ish flying machines on San Francisco Bay, the story of the 1987 “Heart of America Challenge” is a charming if melancholy tale of what sailing competitions used to be. In 1983, after Australia wrested the cup from the U.S., indignant sailors all over the U.S. mounted campaigns to get it back. Gene Kinney of the Chicago Yacht Club asked Melges to lead an effort, one of seven from the U.S.
At the yacht club unveiling, “it was like rock star applause – I’d never experienced anything like that,” Beck recalled. Everyone loved it, with the exception of Gov. Jim Thompson who wanted the boat sailing in corn stalks, Illinois’ leading farm crop. Beck talked him out of it. “Eight-seven was mostly an amateur contest,” he said. The boats were crewed by nationals, it was the last of the 12-meter yachts in the cup, there were still a couple of wood boats competing against aluminum and glass, and the money was chump change compared to today’s races. Melges went to Australia in 1986 with $3 million in cash and a contingent of 40 people. The 26th America’s Cup, broadcast live to the U.S. for the first time, left Heart of America 8th out of 13 challengers to take on Australia’s Kookaburra III. Jobson said the Midwesterners got better with every race. In the end they lacked $200,000 for a new main and jib for the final round-robin Luis Vuitton series. This entry was posted in Uncategorized on October 2, 2013 by jimcarrier.